Do Your Gadget Lights Harm Your Health? If you're not getting a good night's sleep, your laptop, smartphone or tablet are to blame, according to a study from the National Sleep Foundation (NSF). The survey found that 95 percent of those polled use devices with bright screens in the hour before bed, while 60 percent of them say that they have sleep-related problems such as snoring or still feeling tired in the morning. "Unfortunately, cell phones and computers, which make our lives more productive and enjoyable, may be abused to the point that they contribute to getting less sleep at night, leaving millions of Americans functioning poorly the next day," said Russell Rosenberg, Vice Chairman of the NSF. The NSF poll found Americans report very active technology use in the hour before trying to sleep, whether it's using a laptop, smartphone or tablet. "Artificial light exposure between dusk and the time we go to bed at night suppresses release of the sleep-promoting hormone melatonin, enhances alertness and shifts circadian rhythms to a later hour -- making it more difficult to fall asleep," said Charles Czeisler, Ph.D., MD, Harvard Medical School and Brigham and Women's Hospital. 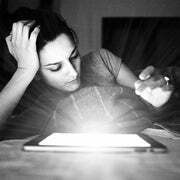 "This study reveals that light-emitting screens are in heavy use within the pivotal hour before sleep. Invasion of such alerting technologies into the bedroom may contribute to the high proportion of respondents who reported that they routinely get less sleep than they need," Czeisler added. Six in ten of those surveyed said they use their laptops or computers at least a few nights per week in the hour before they go sleep. Over half of those polled also said they surf the Internet every night or almost every night within the hour before sleep. This, according to experts, may have consequences for physical health, with about three quarters of those over 30 saying that sleepiness affects their work too. Are our gadgets really messing with our sleep? If the upcoming wave of tablets (like the iPad--15 million sold) are anything to go by, sleep is the only time when people will actually get time away from their electronics. For example, a study found that 20 percent of a user's time with an iPad is spent in bed. "While these technologies are commonplace, it is clear that we have a lot more to learn about the appropriate use and design of this technology to complement good sleep habits," said David Cloud, CEO of the NSF. Do you use your gadgets in the hour before you go to sleep? Does this affect your sleeping patterns? Sound off in the comments.